2. Look at the facts about apple cider vinegar (ACV). Health gurus make many claims for its benefits, some more provable than others. Its use to treat body odor has the science of pH balance behind it, which is a pretty solid foundation. 3. Consider the types of apple cider vinegar. Some experts say that regular commercial products from the supermarket shelf work as well as any others. Some insist that ordinary vinegar is too filtered and distilled to be of use and that only unfiltered ACV brings maximum benefits. 4. 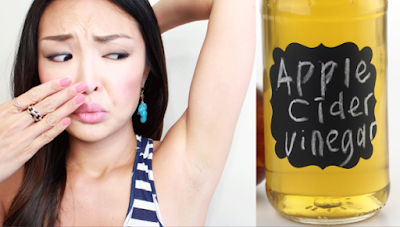 Buy a bottle of the type of vinegar you want to use and keep it in the bathroom. If the bottle is glass, pour some of the liquid into a plastic container, so that the bottle won't break on the tile floor. 5. Bathe or shower thoroughly with anti-bacterial soap. 6. Pour some vinegar onto a soft cloth. A washcloth will do, but don't use the cloth for any other purpose. 7. Wipe the cloth carefully over your underarms.